"Don't you get it? You're a rat in a maze." Two years after losing his wife in the most devastating way, U.S. Marshall Teddy Daniels thought that he had lived his worst nightmare already. That is, until his latest case takes him on a fateful trip to Shutter Island, home to the criminally insane. When a female patient disappears from a maximum security facility on a secluded island in Massachusetts, Daniels and his partner Chuck (played by Mark Ruffalo) arrive on the island to comb the premises. But they end up discovering more about the island than they bargained for, and Daniels (played by Leonardo DiCaprio) ends up in way over his head. Other than its dangerous inhabitants, Daniels later learns the horrifying secret that once you're on the island there's no escape. As Daniels sinks deeper into his case, furiously questioning wardens, guards, doctors, patients, anyone on the island who can give him a clue as to where and how a patient escaped from a dead end island, he becomes frighteningly aware that he may be anxiously chasing his own tail in seeking answers from those in an insane asylum. In a case that's become topsy turvy and new revelations reveal shocking twists, Daniels realizes that, as many of the patients on Shutter Island, he may be losing his grip and has nowhere to run. A twisted psychological thriller that leaves you guessing until the very end, Shutter Island is yet another fantastic collaboration between DiCaprio (giving another pitch-perfect and near heartbreaking performance) and director Martin Scorsese. 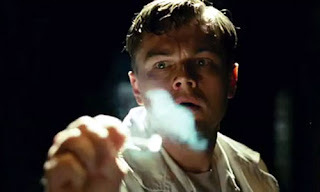 With shady characters, plot twists and deliciously creepy music throughout, Shutter Island lives up to all the hype. DiCaprio is just so darn good in this. Such a powerful performance; it wouldn't have worked with anyone else. Scorsese has made an excellent thriller/eerie movie that just makes you feel for the lead character (DiCaprio). Ruffalo was awesome, wish there was more of him and Patricia Clarkson (Rachel in cave), that scene with DiCaprio was probably tied for best in the movie. I don't know about you but Jackie Earl Hayley made me nervous. Even if the ending is predictable, it's the characters journey that intrigues you. How Teddy questions everyone including himself and you do the same. Beautifully shot and I lived how I feel like I saw a bit of crazy in everyone. Did anyone else focus on the Red Shoes the little girl was wearing? It's like the first thing I noticed and couldn't stop thinking about when Teddy had his WWII flashback and saw her. @andrea i didn't notice the shoes, but really appreciate your comments. you're right, everyone began to question their sanity whcih realy makes it even more eerie. patricia clarkson is always spot on amazing. love her. creepy. I loved this movie, too! I'm really looking forward to this one! I'm looking forward to this one too! Although after reading this review...I better not go ALONE! okay, you convinced me. I'm going to see this movie this weekend. Will let you know what I think. great review. Hey, C. I finally saw it. Great movie, though I thought I saw the twist early on. But I kept thinking about the movie for several days after, and finally realized something I'd missed before about the end. I won't spoil it by sharing here. I'll only say that when you really think about it, the end is even craftier and twistier that it first appears! Did you see what I'm talking about? Love your review.